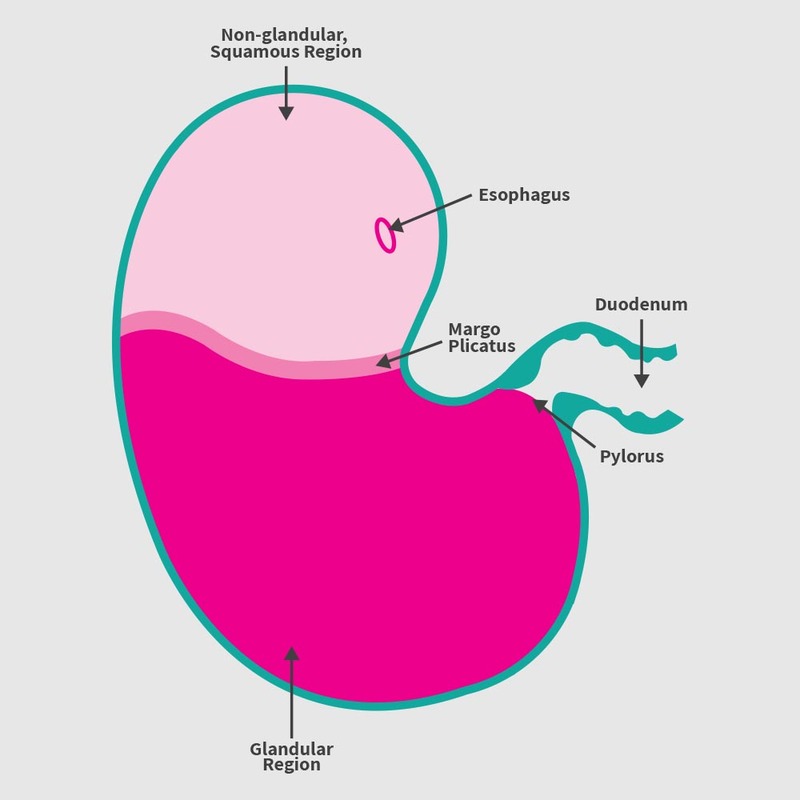 Up to 1 in 3 horses suffer from equine gastric ulcer syndrome (EGUS). Here we talk about what they are, and how we deal with them. To understand how ulcers develop it is first beneficial to have a little knowledge of the anatomy of the horse’s stomach. The horses stomach is divided into two parts; the upper third called the squamous fundus, and the lower two thirds called the glandular fundus. As their names suggest, the squamous fundus is covered by a squamous epithelium, with the lower glandular fundus being covered in glandular epithelium. The acidic stomach contents are produced in the lower glandular fundus. Commonly we see ulcers in the upper squamous fundus, as a result of the acidic contents coming into contact with the delicate squamous stomach lining. The acidity of the stomach contents is reduced by forage passing through the stomach and by the bicarbonate that is produced through chewing. The forage creates a physical “mat’ which sits at the top of the stomach and protects the upper lining from acid splashing up. The most common type of ulcer we see are squamous ulcers, and these develop from acidic stomach contents eroding the epithelium. Horses become prone to ulcers through a number of husbandry systems common in today’s management. Horses are designed to be trickle feeders and normally eat for 16 hours a day. They have a continuous secretion of acid into the stomach, so without food to neutralise it ulcers can rapidly form. Feeding concentrates rather than roughage also contributes as a risk factor, as horses spend less time eating. When kept stabled for large portions of time the amount of time the horse spends foraging is dramatically reduced. Stabling can also cause a physiological stress which can reduce food intake. Blood flow to the stomach (which helps reduce acid) reduces in exercise. Exercise also causes compression on the stomach which can physically push the acid contents up onto the squamous lining. Some long term medications can inhibit production of substances that help protect the stomach. This mainly effects the glandular tissue. Physical stress, illness and physiological stress can all predispose a horse to developing ulcers. Transport and stabling are proven factors in causing ulcers. The only way to truly diagnose ulcers is by gastroscopy – the passing of a camera into the stomach to visualise the stomach lining. Your vet will be able to grade any ulcers and come up with an action plan. Typically treatment is a course of Omeprazole.